Now that she’s a working mom herself, registered dietitian Caitlin Boudreau knows how fortunate she was to have healthy, tasty lunches to take to school when she was growing up, especially since both her parents worked outside the home. The founder of Wee Nourish admits, though, that there was a time when her folks must have been scrambling to get her and her siblings’ brown bags filled. “I was lucky that my parents worked hard to make great lunches for me, which I now realize is a massive feat, given that I was the third child and both my parents worked,” Boudreau says. “I won’t lie, though. I do remember a phase where I was packed the same thing every day: a juice box, sandwich, and apple or banana. Most parents dread that scenario: their kids tossing the food they so lovingly (if rushingly) packed for them in favour of a bag of chips and a Snapple. Now is the time when most moms and dads start bracing themselves for the start of the school year and the reboot of the morning routine that involves stuffing something nutritious and delicious into their kids’ lunch box. And it’s not just young students who face the potential dullsville of brown-bag lunches: so do working folk who would rather fork over money for a Starbucks wrap than face a homemade ham sandwich day after day. Boudreau, who specializes in helping parents with picky eaters, says that when it comes to whipping up wholesome, portable midday meals, it’s easy to get stuck in a rut. After a while, a lunch of hummus, pita, and baby carrots becomes pretty darn boring. At the same time, no one wants the pressure of creating a lunch that Gordon Ramsay would approve of. A satisfying lunch that will sustain you through the afternoon consists of three core elements, Boudreau says: a good source of protein, such as meat, fish, legumes, or tofu; a starch (whole-grain rice or bread, for example); and some vegetables. Maybe add some fruit. “The goal isn’t Pinterest-worthy masterpieces,” she says. She suggests that people think outside the sandwich bag. “We can get some great ideas when we look at what other cultures serve their kids for lunch,” Boudreau says. Examples? Simple burritos or baked or refried beans with a side of rice and veggies. Stir-fried rice with beef or chicken and veggies, using extra rice made for dinner the night before. Then there are twists on lunchtime standbys: instead of a chicken caesar wrap, stuff a tortilla with whatever appeals to you. (Boudreau’s three-year-old is currently fond of tuna and cheese.) Make pancakes with sweet potato, pumpkin, or yogurt, which are variations on the classic that don’t call for much sugar. 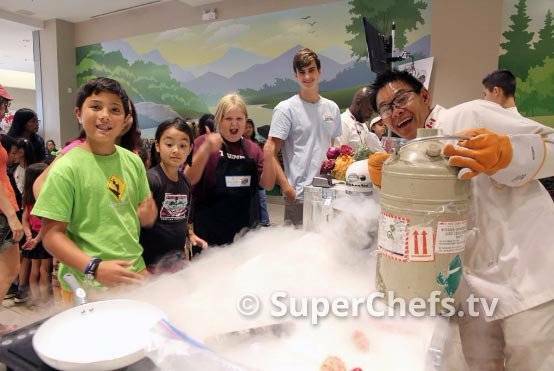 Surrey dentist Greg Chang, a trained chef who founded SuperChefs of the Universe, a course and TV show that teach kids how to cook, suggests investing in a Thermos. It also helps to think inside the box—the bento box, that is. Those Japanese-style boxed lunches allow for nutritional balance and colour since they can be filled with small portions of a variety of food; think cut-up fruit and vegetables, cheese, crackers, deli meat, edamame, pickles, mini quesadillas and sandwiches, and so on. For those who do have the time and inclination to make masterpieces, check out kyaraben, also known as “cute bento”, in which popular anime characters, animals, and even nature scenes are created with food. The style is a growing trend in Japan, where there are kyaraben contests and cookbooks and where moms make elaborate Pokémon characters out of everything from fish and meatballs to rice and beans using stencils, cutters, and hole punchers for nori (dried seaweed).